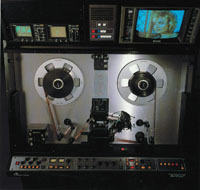 VideoStation UK was formed in 1980 by Larry Jamieson, in order to transfer film for the budget video labels. The business expanded after we were able to convert our telecine machine, to transfer some old home movies for a BBC production. Today, we transfer all gauges of film for both production and private use. Clients include art school students, home movie enthusiasts , family history archivists, film collectors, corporate and state film archives, film production companies, etc. VideoStation UK was sold to Joseph Faul in November 2009, who now operates the business from the new offices in Chiswick, London. The side picture shows some of the vintage equipment required to restore old television programmes. 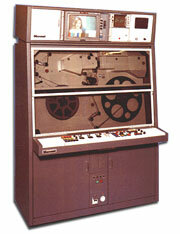 Below is a professional telecine machine as used to transfer archive film today.